Vendor: Home School Adventure Co.
Age Range: For read aloud and discussion as a family: ages 9-11. For ages 12 and up, also great for family discussion and/or parental/teacher guidance. High schoolers can do this on their own. Mom.. what does it mean "to preach Christ from envy and rivalry"? Mom.... when it says Selfish Ambition... what does that mean? 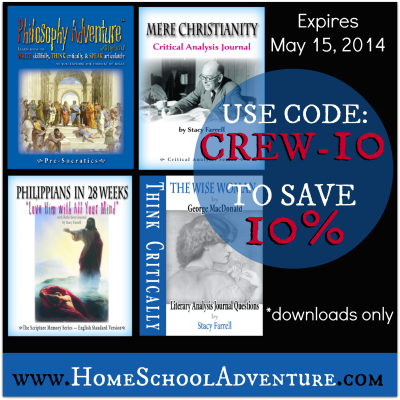 For those questions (and others like it) I heartily recommend doing this bible curriculum with your children. I LOVE the questions. And I didn't get those questions the first week that I read from Philippians... I got them in week three... when we'd read it enough he was starting to say words with me. And that is when the questions started to come. Mom.. what does it mean. Mom.. why? Mom.. what happened? Mom, I don't understand. I DID NOT anticipate that. I figured you hear something once, you don't understand, you ask then. I didn't expect the slowness of the questions. So it surprised me and totally delighted me. :) But when the questions started, they continued...and so one eight year old boy has a better understanding of the first chapter of Philippians. And I say the FIRST chapter of Philippians. I have to admit, I could not keep up the pace of the program. And that's one of the nice things about this program. We could not keep up the pace of learning 5-6 verses a week so we slowed it way down. We could manage two-three. So we'd do the copy work. We'd say the verses together. We sometimes could get a rhyme/rhythm/tune going which makes it easier to say and remember. We'd think about the verses, and we were aided in that thinking with questions provided. So just what is Philippians in 28 weeks all about you ask? Well, it's a program (I received it as an e-book) whereby you set out to learn Philippians (the whole book) in 28 weeks. They come with nifty little scriptures cards (I have to admit, I found the print of them too small and needed to rewrite them) so you can carry the verses with you to learn... though after I expanded the text I got this brain storm and downloaded an ESV bible onto my phone and VOILA, even my boy could find the verses easily AND I could make it into a font size I could read easily! TADA! I was so happy I had that brainstorm. So now we could do it in the car as well. :) With it comes sheets for doing bible copywork as you write out each verse. Have to admit.. my son DISLIKED this intensely. Oh my... the first time he did it he had a minor meltdown so one verse a every other day.. that worked for us. :) Prevent melt-downs and continue to learn... that's what it is all about. Would I recommend this course? Yes. EVEN THOUGH we didn't quite work this out the way I had intended (with Dad taking an active part in the reading and memorization) ... I had failed to take into account memory issues that have lingered since his stroke four years ago. My bad.. sometimes I get ahead of myself that I forget to think that aspect of things through. I do think that if you have older children say... 9 years old and up it might be easier for them to work on memorizing it on their own, but my eight year old gave it a game try with me.. we worked on learning Philippians together... and we did manage to get a good portion of the first chapter of Philippians memorized. (We surprised dad). :) AND I'm glad that we did do it more together as it gave me a chance to be surprised by my son's questions. 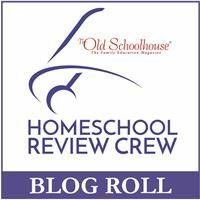 Anyways, I have given you my experiences with using this scripture memory system, we on the TOS crew have been reviewing a number of different items for the Home School Adventure Co.